One of the things I love about blogging is the painless (meaning with no effort on my part) encounters with fascinating new information. Gigi, blogging at gigihawaii, visited my Mardi Gras 2012 post, and her comment sent me to Wikipedia to find out about malasadas, the Portuguese donuts that are a Fat Tuesday tradition in Hawaii. Wikipedia said that malasadas are made of egg-sized balls of yeast dough that are deep-fried in oil and coated with granulated sugar. Photographer's info didn't include name. Or at least I couldn't find it. But I am including the photog's comment. 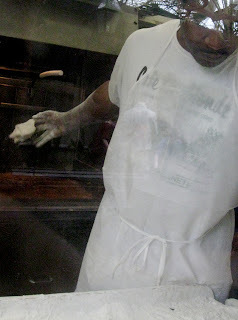 It was tasty: (Leonard's Bakery, Honolulu, Hawaii) We couldn't decide! So ended up getting at least one of each of the flavor-filled (custard, chocolate, haupia, guava) malasadas, a cinnamon plain one, and an original one. 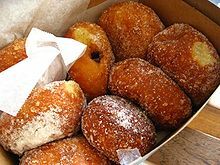 According to Wikipedia here, eating malasadas on the day before Lent dates back to the days of the sugar plantations of 19th century Hawaii. 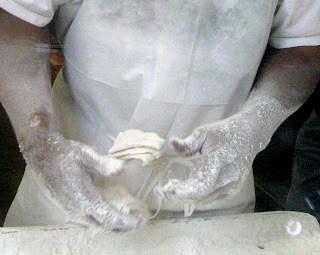 The resident Catholic Portuguese workers, mostly from Madeira and the Azores, would use up all the butter and sugar they had prior to Lent by making large batches of the traditional pastry. Malasadas sound similar to the beignets hubby and I like to indulge in at Café du Monde in New Orleans, except beignets are flat squares of dough deep fried then adorned with a generous dump of powdered sugar. I guess every culture has its own version of deep-fried confection. I always like to stroll along the back side of Café du Monde. There is a window there that lets me see the beignet makers in action. Glare was a problem for the camera during this February visit but not for me. I received my visual fix that will hold me until our next NOLA jaunt. 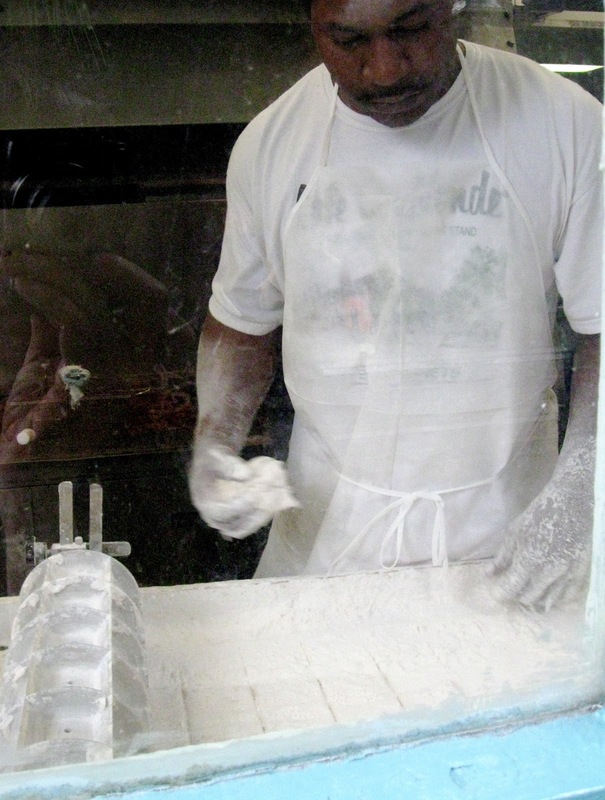 A motorized gizmo cuts the dough into squares. I guess my lifetime lack of coordination, including in the kitchen, is the root of my fascination with these guys’ skill. The whole process is one of speed and muscle memory. Note: Blogger has struck again. I decided to cut and paste a paragraph into a different position. That made the paragraph that preceded the cut text jump to a larger size type. I tried every trick other bloggers suggested when this happened once before. It drives me crazy, but maybe I have learned my lesson this time. Note to self: Self, after a post is published, Do Not Do any edits that involve moving text around. Resist the urge to tinker. I repeat. Resist the urge! Do you think Blogger has me trained yet? Whatever Blogger was doing, it worked out. 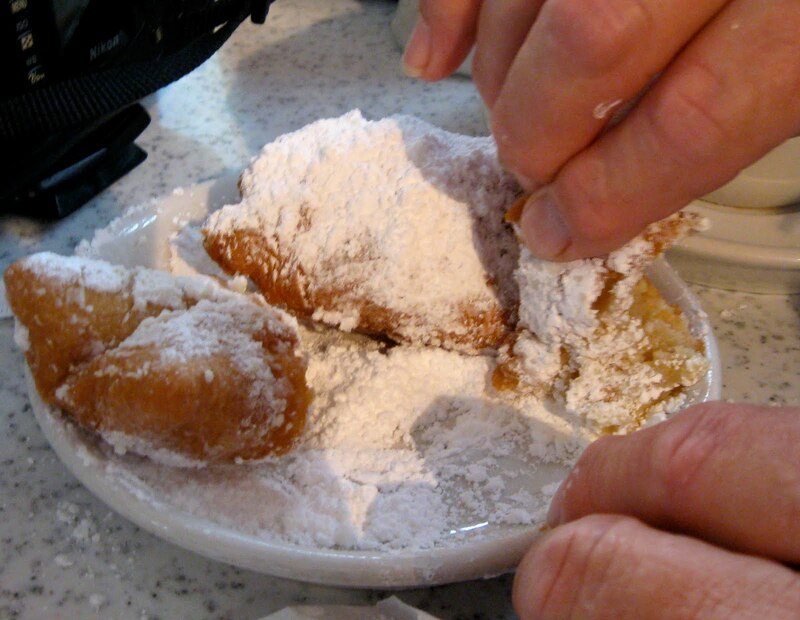 I am drooling all over the keyboard about the beignets! It has been a long time since I've enjoyed them. sighhhh. I have never heard of this Hawaiian food! I love the pictures of the man making them! I have had problems with text size in blogger. People think I do it on purpose, but not so. Now I know what the deal is! So I need to post extremely thoughtfully, thanks for the warning! Wow, these look good. This was very interesting. I always see things I want to fix also, but I try to resist the urge. Even when editing needs to be done, and even when my grammatical or typing errors are glaring, I don't go back and fix them because it seems to mess everything up. Mardis Gras traditions in Hawaii. Who would have thought? Both look too yummy but considering the logistics, Beignets may be the only ones doable. I love to watch people good at their work. This post makes me want to go to Leonard's Bakery and buy a box of malasadas. They are soooo delicious! I loved eating hot Malasadas from the vendors (likw ice cream vendors!!) when I lived in Hawaii. I even got a recipe for Portuguese sweet bread, which is the dough in the Malasada. I tried making it, but alas, I am no bread baker. Malasadas are better than regular donuts and different from beignets, but you would like them I am sure. Why are the most delectable foods always so calorific? These deep-fried goodies look delicious, thanks for reminding me what I'm missing. Boohoo! I'm visiting and catching up. I've gone back and read the posts I missed (and left comments).